Paulina Czop has gained legal practice and experience working with law firms FORYSTEK & PARTNERZY in 2012 – 2017 and DAWID & PARTNERZY in 2017 – 2018. While working with FORYSTEK & PARTNERZY, she provided legal advice to companies in the chemicals and energy industries (Grupa Azoty S.A., Tauron PE S.A.). In 2014 – 2016, she advised transmission companies on matters related to claims regarding the location of transmission facilities and the legalisation of such facilities. Moreover, Paulina has provided legal assistance to developers in procedures for obtaining building permits, determination of the conditions of land development and use and procedures concerning environmental conditions. 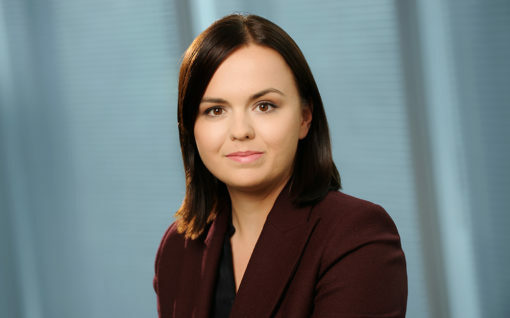 In 2017 – 2018, Paulina worked with the Częstochowa office of DAWID & PARTNERZY Law Firm, where she provided legal advice and opinions on proceedings concerning usucaption of transmission easements and compensations for the use of real properties without title. Since 2018, Paulina has been a lecturer at Jan Dlugosz University in Częstochowa. She specializes in procedural and substantive administrative law, in addition to civil law. She has represented clients before administrative authorities, administrative courts and common courts in a variety of cases. Membership: Częstochowa and Piotrków Bar Association. She passed the Bar exam in 2017. Education: Jagiellonian University, Faculty of Law and Administration (Master of Law, 2013), “Environmental protection law in the European Union law and Polish law” (post-graduate studies, Jagiellonian University, 2015).